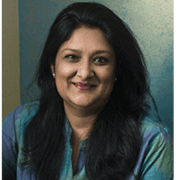 Former CEO, Indus League (brand division of Future Lifestyle Fashion) Rachna Aggarwal is currently advisor to Shoppers Stop, mentor at NSRCEL, IIM – BANGALORE, and founder angel investor with Angels 92. 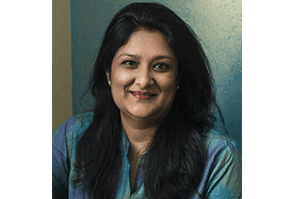 Rachna completed her schooling and college in Kolkata, receiving a B Sc (Economics) from St. Xavier’s college and PGDM from IIMA in 1992. During her seven-year stint with Madura Garments (a division of Coats Viyella Plc), she was Asst. Brand Manager for Van Heusen. Later, as Group Brand Manager, she introduced the concept of “Friday Dressing” to India through the successful launch of Allen Solly. In April 1999, she left Madura Garments to join a team of professionals promoting Indus-League Clothing Limited (which later merged into Future Lifestyle Fashions) She served as CEO of Indus-League from 2008-2017, managing a diverse portfolio of brands including Indigo Nation, Jealous 21, Indigo Nation, Scullers, Manchester United, Converse, Giovani.